In honor of #WorldBookDay, this week on the Apochromatik blog we’re talking about why and how to squeeze more reading into your schedule. For today’s Video of the Week we feature a short eight minute video discussing some of the benefits of reading. Check back for Thursday’s post where we share hacks to fit more reading into your schedule. April 17, 2019 at 12:00 p.m. central. Apochromatik's Keith R. Sbiral was recently interviewed on executive presence and overcoming the fear of public speaking on the "A Road to You" Youtube channel. Executive presence will be the topic on the Apochromatik blog Thursday as well. This week we are focusing on the job search process and ensuring that your resume matches the skills employers seek. Be sure to visit www.apochromatik.com/resumeredo to download the free 5 1/2 Steps to Trash Proof Your Resume, and listen to this video by Jason Green, founder of Skillsmart. This week’s blog topic is video job interviews. More and more employers are using them, whether as a replacement for phone interviews or even in place of in-person interviews. Thursday’s post provides 5 tips to ace your video interview. Before we get to substance, though, here’s a light-hearted reminder of why video interviews require special preparation. Close your door, and get ready for 45 seconds of hilarity that you’ll avoid by following Thursday’s tips. This week’s topic is how to serve your network. For the Video of the Week, we’re featuring one of our favorites: Drew Dudley’s “lollipop moments” TEDx Talk about everyday leadership. Invest 6 minutes in this great reminder that a small favor can make a big difference. And check back for Thursday’s post on easy ways to help others in your network. Do you groan when you hear the phrase “business travel”? Even if you love business travel, it can make it hard to progress on your goals, which is why it’s this week’s topic on the Apochromatik blog. First, to discover the joy of business travel, argues Joaquim Bretcha, focus on people, an attitude of introspection, and language. Bretcha’s TedX talk is this week’s Video of the Week. Check back Thursday when we share tips to make business travel more enjoyable and productive. This week, we’re addressing procrastination on the Apochromatik blog. For today’s Video of the Week, Mel Robbins explains that procrastination is a habit we adopt as a form of stress relief and shares strategies to interrupt the habit. Check back Thursday when we share 6 specific tactics to get every procrastinated task off your to do list. Both convey the importance of knowing what you want to do, which is something we help our clients determine every day. Check them out, and look forward to Thursday’s post, when Keith R. Sbiral shares how to fall back in love with your career. This week we’re addressing stress and anxiety on the Apochromatik blog. For the Video of the Week, Dr. Kelly McGonigal, author of books including The Willpower Instinct and The Upside of Stress, argues that harmful effects of stress on your health are not inevitable. Research actually suggests that her advice might just change how you think about stress and, by extension, the effect it has on your body. As National Mentoring Month draws to a close, this week’s Video of the Week is actually a webinar on making the most of a mentoring relationship. Click the image below to register and view the free webinar. Mentoring month continues. This week, Chip Conley, the author of “Wisdom at Work: Making the Modern Elder," discusses intergenerational mutual mentorship and the importance of the diversity of age in the workplace. The best time to start to create a career that you are excited about starts right now in the first quarter of 2019. Take 12 minutes to start the process and learn some key insights from Chip Conley’s time at Airbnb. Tim Ferriss, the author of "The 4-Hour Workweek" and "Tribe of Mentors," says the best mentors won't give you all the answers, but will give you the ability to find the answers yourself. In less than two minutes you can gain clarity about creating a great mentor relationship. The best time to start to create a career that you are excited about starts right now in the first quarter of 2019. Take 2 minutes to start the process. As we transition from the hectic holiday lead-up to what are hopefully more relaxed days over the holidays, we encourage you to take some time to consider what you want to make of the coming year. How will you make 2019 the year you stop tolerating and start building the life and career you want? If we can help along the way, please reach out. But in the meantime, check out today’s Video of the week as David Brooks discusses Résumé vs. Eulogy. It’s only five minutes. Have you received enough Black Friday, Cyber Monday, Giving Tuesday emails? Did you wake up this morning to realize that Cyber Monday seems to be extended? Are you bored or frustrated with your technology devices? Numbing boredom with digital devices can hinder your creativity. 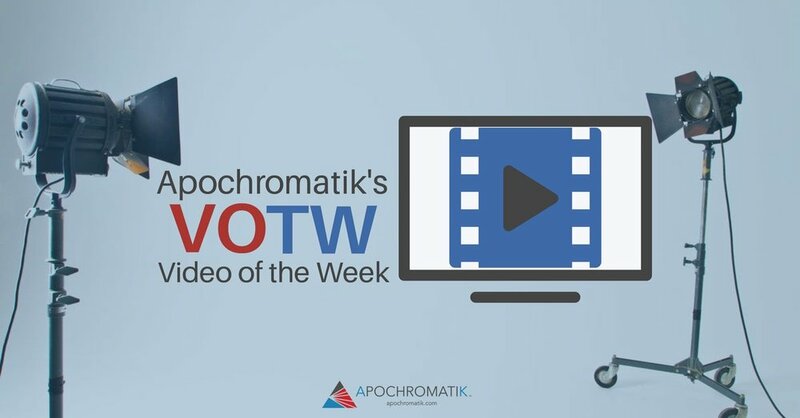 In this week’s Video of the Week, tech podcaster Manoush Zomorodi explains why a little boredom can help you be more creative, and explains a challenge that can help you get your tech usage out of the way of your own creativity. Understanding the distinction between them allows you to have much more impact, meaning, and productivity in your life and with the people around you. He also discusses how to maintain a habit of expressing appreciation, how to accept a compliment, and important research in the field of positive psychology. He also shares what it felt like as a professional pitcher when he was pulled off the mound mid-game. You’ll view appreciation in a whole new light — and be less likely to taunt an exiting pitcher in the future. Your professional network just may be your biggest career asset, which is why we’re focusing on networking on the Apochromatik blog this week. First, in this week’s Video of the Week, the Harvard Business Review shares five ideas in under 60 seconds to help you expand your network. Have more time? Check out this 60 second Harvard Business Review video sharing three tips to make networking less awkward.